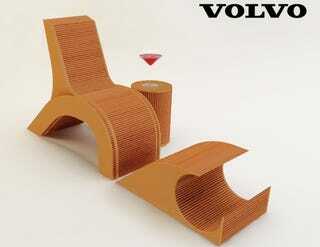 This modular cardboard lounge chair designed by Luis Fernando Luna Bermudez, a Universidad de Monterrey student, took top prize in the 2007 Volvo For Life Design competition. It's inspired by a Volvo C30 taillight. Paris Auto Show Reveal: Volvo C30 Hatch! The chair was chosen as tops in the Sustainable Design category, and one look at the clever design tells you why. It combines a shape taken from the tail light cluster of the Volvo C30 and laminated cardboard for a modern seating design. The block design pulls apart to reveal an included ottoman and a side table, perfect for what looks like a cherrytini.